The 28th Bellevillite definitely known to have been killed in action in this war was Pfc. 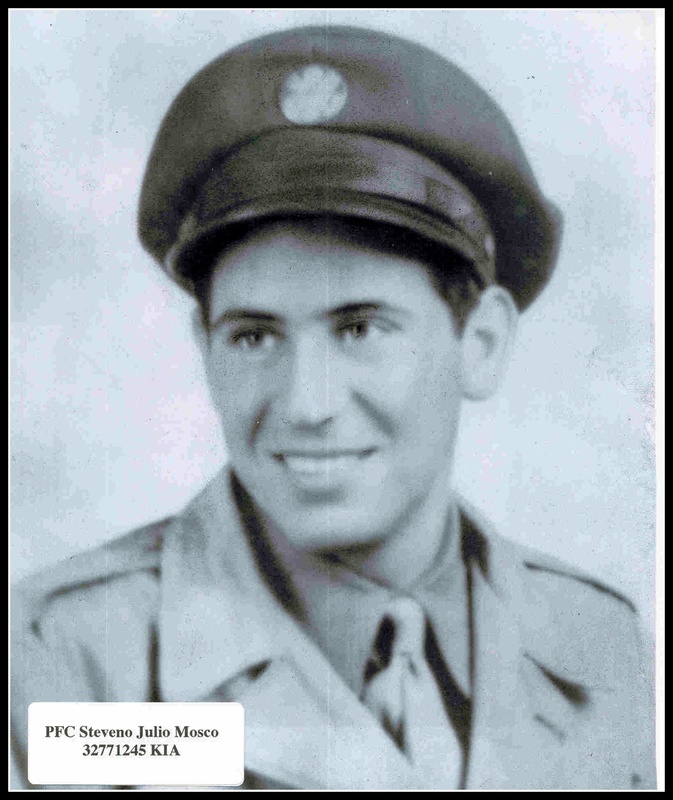 Steveno J. Mosco, 20, of Honiss Street who died in Normandy July 27, 1944. Pfc. Mosco had been in France only two weeks when he was killed, according to his wife, Mrs. Rosemarie Cappetta Mosco, and his parents, Mr. and Mrs. Giro Mosco of Honiss street. Born in Belleville, he lived all his life here. While attending the high school he became well-known as "Ju Ju" Mosco, captain of the Panthers, intermediate basketball team. He was employed with the Atlantic Paper Tube company of Belleville at the time of his induction into the Army March 8, 1943. He went overseas with an infantry unit last May. "I'm in a new division, the 79th Infantry Division, the ones who took Cherbourg," he said in his last letter home, written ten days before his death. Besides his wife and parents, he leaves four brothers, Pvt. Charles P. Mosco with the signal corps in France, Harry Mosco of East Orange, Salvatore and Victor of Newark. He is also survived by two sisters, Mrs. Nancy Teal whose husband is an Army private in France, and Miss Gloria Mosco at home. The youngest son of Mr. and Mrs. Giro Mosco, of Honiss street, was inducted March 8, 1943, and sent to England last May. He was placed in a machine-gun squad when he was sent to France. At the time Mosco was killed, he had been in Normandy one month. In his last letter home on July 17, he wrote "I'm in a new division, the 79th Infantry Division, the ones who took Cherbourg". Several weeks ago, he met a Belleville friend, Benjamin Petrillo, in France. "It was an awful place to meet a friend," he wrote, "but it was a meeting we'll always remember." Mosco, who was known as "Ju Ju" to his friends and family, was born in Belleville and attended the high school there. While in school he was a prominent member of the basketball team. Before induction into the army, he was employed by the Atlantic Tube Co., Belleville. Another brother, Pvt. Charles P., 21, is with the Signal Corps in France. 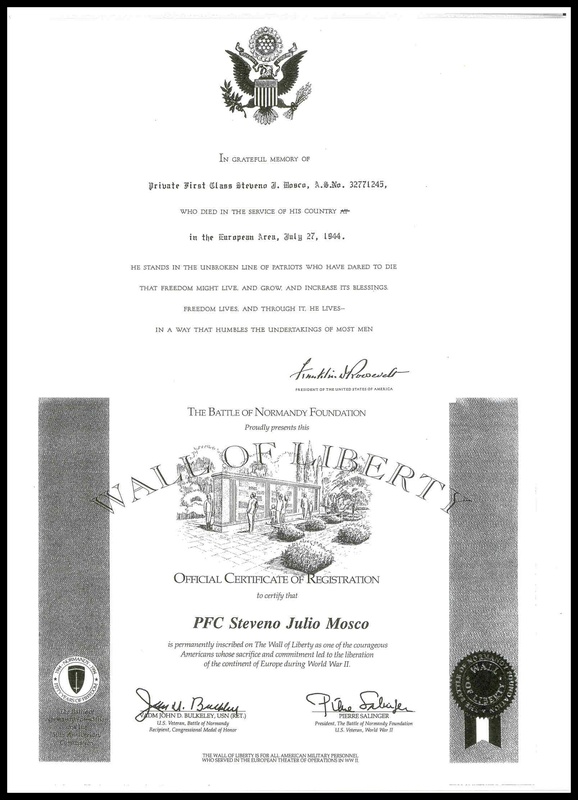 Private Steveno Julio Mosco, of Honiss Street, was killed in action on July 27, 1944. Born on December 26, 1924, he enlisted in the Army on July 27, 1944. He served in the 79th Infantry Division. The Barbone-Mosco Post #7 Italian American War Veterans was incorporated and established in Belleville, N.J.
His service number is 32771245. He is buried at the Mount Olivet Cemetery, Bloomfield, N.J.